The Marshall Islands, Solomon Islands and American Samoa all began competition at the Rio Olympics on Tuesday. RNZ reports Marshall Islands weightlifter Mattie Sasser finished in 11th place in the women's 58kg division with a combined lift of 199kg, while Jenlyn Wini from Solomon Islands was 15th after lifting 188kg. Lifters from Thailand claimed both the gold and silver medals. American Samoa judoka Ben Waterhouse made an early exit in the 73kg division against Sri Lanka's Chamara Repiyallage. The territory's Chef de Mission, Genhall Manua Chen, said it was exciting to see their own athletes in competition, even if it wasn't the result they were hoping for. "It was because he received three yellow cards and that meant he didn't attack as much as the judge wanted him so that ended the bout but Ben was on his game - the Sri Lankan scored one point, just one. I think his last bout his coach said was about a year ago - it was just a lack of having a good training partner or a lack of training with somebody his weight. I think it had to do with the lack of training time that he had." The Fiji women's sevens team have finished eighth at the Rio Olympics after losing 21-0 against Spain in their final match. 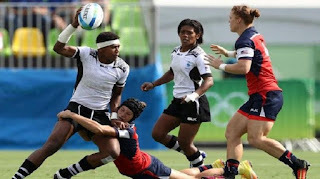 Having missed out on a semi final berth, the Fijiana were beaten 12-7 by the United States at the Deodoro Stadium - a reversal of the scoreline when the team met in pool play - before being outclassed by the Spaniards. Fiji's eight placing matches their final ranking in the past two World Series campaigns. Australia won the first women's rugby sevens Olympic gold medal, beating New Zealand 24-17 in the final, while Canada beat Great Britain 33-10 in the bronze medal playoff. Papua New Guinea weightlifter Morea Baru finished sixth in the men's 62kg division with a combined lift of 290kg, 15kg shy of the medal placings. Samoan weightlifter Vaipava Nevo Ioane finished eighth with a total lift of 281kg. Cook Islands kayaker Ella Nicholas missed out on the semi finals in the women's K1 canoe slalom, after finishing 18th of 21 in the heats. Fiji's Robert Elder and Tonga's Arne Jensen have been eliminated in the men's archery round of 32.